I must admit that Travels in Elysium did not turn out to be the book I expected. The first couple pages are very lyrical so I thought that the book would continue in the same vein. I was rather disappointed to find the tone quickly changed to a realism that jarred me after the dreamy opening. I was pleased to find that Azuski uses the same lyrical tone to describe places and people and he is very good at these captivating, detailed descriptions. He creates vivid images of Santorini’s dramatic landscape and unusual characters. Although I developed clear mental images of the characters I didn’t feel that I came to know much more about them. Azuski hinted at their secrets and motives but he never developed this. I learned enough about some characters, such as vulnerable Anna and secretive Sam, to form a loose attachment to them but I was still left wanting more from them. Nico, who recounts the tale, seems to grow very little by the end despite the harrowing events he experiences. His employer, Marcus Huxley, is a driven man, consumed by his own passion. In most scenes he is in a foul temper and this portrayal of him often reduces him to a caricature or stereotype. He could have been developed into a much more credible character. The book is billed as a philosophical and psychological mystery so don’t expect a fast paced read. There are sporadic episodes of gripping action but it isn’t a chair grabber. The storyline, and all the mysteries that go with it, are woven into an ongoing philosophical discussion between Nico and Huxley about the nature of reality. I felt that this device dragged out the plot. Although the philosophical ideas discussed might need explanation, the long, repeated conversations were unnecessary. Too many clues led nowhere and subplots, such as Nico’s internal conflict about the death of his father, drew the reader away from the central story. The way the plot wandered left the reader confused. By the end of the story some mysteries had been revealed but others were never explained. Many incidents that had seemed important clues were never mentioned again and I wondered why they had been included. I don’t mind being led up the odd blind alley as a device to keep the reader guessing but this novel did it too often and I found this frustrating. I also felt that the ending did not do the book justice. It was a convenient, even clichéd, way to bring strands that were meandering aimlessly to an end but not a conclusion. There were several strands of the plot that gripped me and held my attention – I lived those moments with the characters. I was intrigued and sometimes moved by the experiences of the main characters in House 34 and I was thrilled to experience their first forays into hidden passages under the volcano. I enjoyed Nico’s brief tryst with Celeste, Sam and Ari’s uneasy friendship and Anna’s reunion with her husband. And I was moved by the conversation between Fr Nannos and Huxley when the priest is on his deathbed. But there were too many places where the plot wandered off aimlessly and the philosophical discussions were repetitious, making the book tough going. I’ve been neglecting the rest of my reading pile lately as, at more than 500 pages, this was a very long book. I started reading it with anticipation but my enthusiasm trickled away page by page. While I saw Azuski’s writing ability peeking through in many places throughout the book, I felt that I would have enjoyed it more if it were more tightly edited. I enjoyed the sense of being in Santorini but would have liked events to have been a little less muddled. So I’m afraid that I cannot recommend Travels in Elysium as heartily as I would like to. Although it wasn’t my cup of tea, this book may appeal to other readers so I’ll leave the publisher with the last word and also give readers a chance to sample the novel: Literary fiction blends with Plato’s tale of Atlantis is this metaphysical mystery that takes place on an archaeological dig on the island of Santorini. Travels in Elysium is written in an allegory style. If you would like to read an online excerpt – we have one posted here . For more information or to get your own copy, visit the book’s Amazon page. About William Azuski: He was born in the United Kingdom, and is of British and Yugoslav descent. 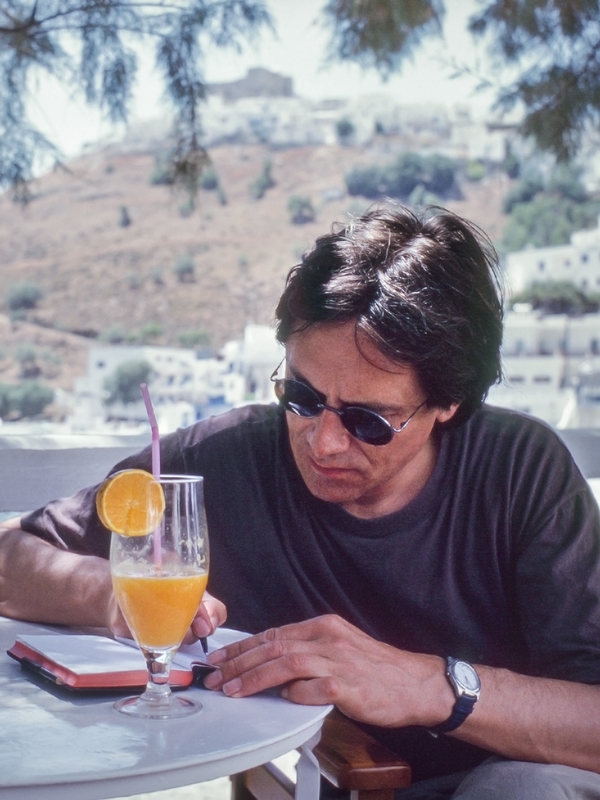 Travelling widely through the Mediterranean since childhood, his frequent sojourns in Greece included several months on Santorini in the 1970s, an experience that provided firsthand experience for the novel’s local setting. Writing as William Miles Johnson, Azuski is also author of the critically-acclaimed The Rose-Tinted Menagerie, an Observer Book of the Year (nonfiction), and Making a Killing, an end of the world satire, both titles recently republished by Iridescent. 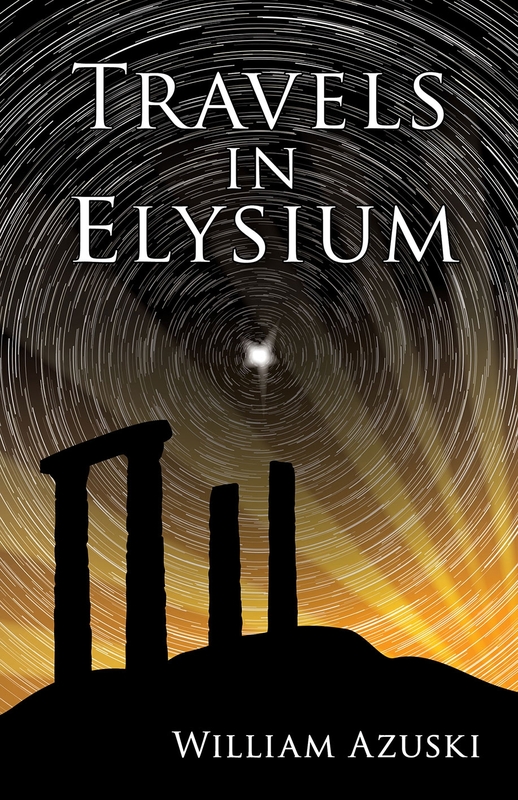 This entry was posted in September 2013 and tagged archaeological fiction, philosophical mystery, psychological mystery, Santorini, Travels in Elysium, William Azuski. Bookmark the permalink.